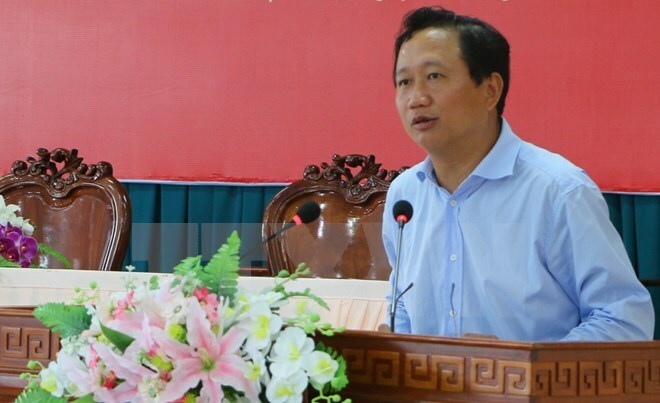 Hanoi (VNA) – With 100 percent of votes, all members of the Secretariat of the Party Central Committee have agreed to expel Trinh Xuan Thanh, a member of the Hau Giang provincial Party Committee, from the Party. The Secretariat made the decision at a meeting on September 8 under the chair of General Secretary Nguyen Phu Trong after considering a report on the case by the Party Central Committee’s Inspection Commission. The Secretariat concluded that the mistakes and law violations committed by Thanh are serious, sparking public concern and damaging the prestige of the Party, State and the official himself. After being transferred to the Mekong Delta province of Hau Giang, while serving as a member of the provincial Party Committee and Vice Chairman of the provincial People’s Committee, Thanh used an official plate on his private-owned luxury Lexus car, which was illegal. The Secretariat also noted that as Thanh was responsible for the wrongdoings, law violations and losses at the PVC, leaders of the Vietnam National Oil and Gas Group assessed that he had not fulfilled his duty and removed him from the position of Secretary of the Party Committee and Chairman of the Board of Management of the PCV. This meant he was not eligible for any promotion or transfer, but Thanh himself proposed for his transfer and let relevant agencies conduct procedures to appoint him to leading positions at the Ministry of Industry and Trade and Hau Giang province, which showed his dishonesty and irresponsibility.